Currently, our ocean and lakes serve as the main source of animal protein, by providing fish from wildcatch. Over 2.5 billion people depend on it every single day. At the same time, our global fisheries are significantly larger than what our oceans can sustainably support. This simply means that we, humans, take far more fish from the ocean than the oceans can naturally replace. Therefore, we should stop plundering our oceans and lakes and alleviate the pressure on it. We have an alternative in aquaculture — known as the farming of fish, plants, shellfish and crustaceans. Farming fish instead of ‘hunting’ for it, in the wild. Worldwide, aquaculture now actually produces more than what we catch from the wild. However, not (yet) so in Africa. Of the worldwide aquaculture output, only 2.5% is farmed in Africa, according to the FAO. Most of this is concentrated in 2 countries, Nigeria and Egypt. Contrast that with an African population set to rise from 1 to 2 billion (>20% of the world’s population). And the stage is set for a blue revolution. Demand for fish in Africa is thus going to go up, whilst wild-catch is declining. This leaves fish farming or importing fish as the two main options to provide fish to the growing consumer base. Africa is under the spotlight when it comes to global food security. And food security is best achieved by sustainable local production. Thus, it is important to look inland, towards sustainably farming freshwater fish. For this reason, FoodTechAfrica was established. A public-private partnership combining the strength and expertise of 14 partners, all active in the Aquaculture value chain. 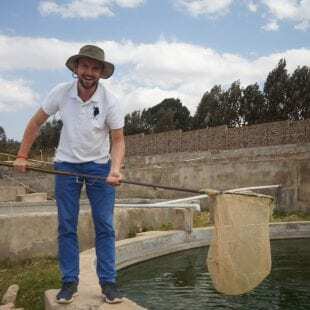 Together, we created and put in place an approach toward creating a sustainable aquaculture sector in East Africa, starting with the basics: (1) feed, (2) fingerlings, (3) sustainable production systems and (4) processing. Till date, most government and donor programs have aimed at stimulating aquaculture in East Africa by focusing on smallholder farms and stimulating their output. However, fish feeds make up roughly 70% of the cost for a fish farmer. So, not having local fish feed production is like having a ‘truck without an engine’. It’s hard to get moving. With the combined expertise of Ottevanger Milling Engineers, Almex, Skretting and Unga, a state-of-the art fish feed facility is being established, producing high-quality feed in the heart of East Africa, Kenya. At the start of the aquaculture value chain are fingerling — baby fish or fry. Proper fish farming requires breeds developed specifically for aquaculture. Using improved varieties of tilapia increases breeding success, fish growth rates and their survival and success in aquaculture systems. Breeding programs can help in both food security efforts and in increasing the socio-economic benefits of tilapia farming. Aquaculture requires stakeholders, farmers and investors to ‘think ahead’. With water and land becoming even more scarce resources, fish farming should use the least amount of these resources as possible. The FoodTechAfrica partners therefor developed a recirculating aquaculture systems (RAS), specifically for application in East Africa. This system operates by filtering water from the fish tanks so it can be reused. This dramatically reduces the amount of water and space required to intensively produce fish. The steps in RAS include solids removal, ammonia removal, Co2 removal and oxygenation. Also, the system simulates a stress-free environment for the fish, reducing mortalities and improving the feed conversion, growth rates and quality. The result is a system providing 100 times the output as compared to a fish pond of the same surface. Moreover, a viable business case in which a farmer can sustainable produce fish for the local market in East Africa. Getting fresh fish to the market is the final, yet equally important, step of the value chain. Preventing wastage requires a holistic approach to include processing, packaging, marketing and distribution of fish. Existing team expertise and proven solutions blending with local insights is the best way to serve local consumers with fresh, healthy fish. Above all, creating a vibrant and successful aquaculture sector in East Africa requires cooperation between the different stakeholders. With FoodTechAfrica, we leverage the combined expertise of the partners in creating a viable aquaculture sector for East Africa. That’s how I committed myself to a fascinating and rewarding journey towards a blue revolution in East Africa. Keep updated on our progress on FoodTechAfrica.